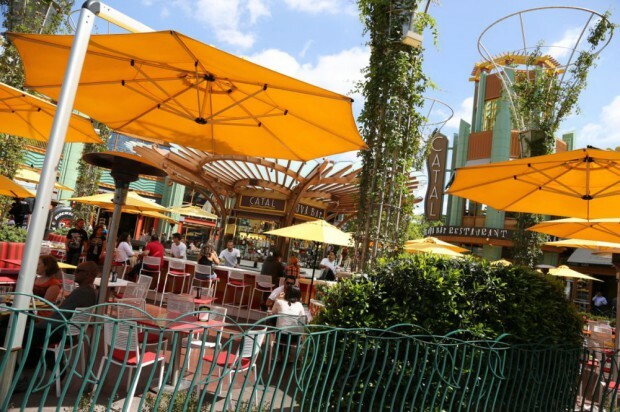 Downtown Disney is very busy, with visitors throughout the day and local residents enjoying a night out in the evening. 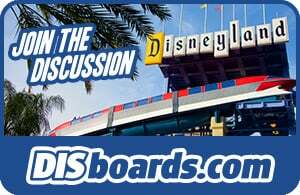 Now that the bag check areas have been moved, popping over to Downtown Disney for lunch is even easier. There are several great places to eat and/or drink, but for dinner, you may want a reservations, as the most popular places get very busy. 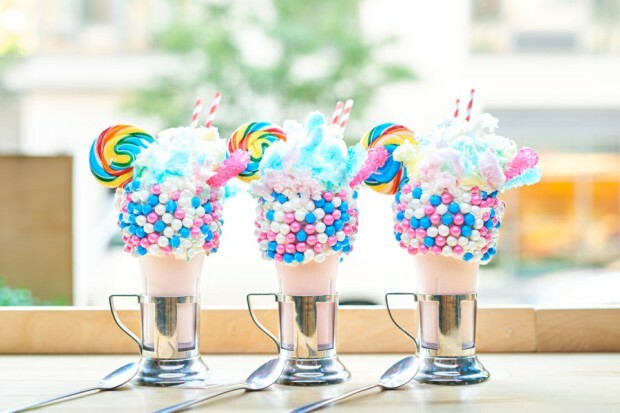 The choices lean heavily toward table service, but there are a few quick options available. Black Tap Craft Burgers & Beer - Opening Soon! 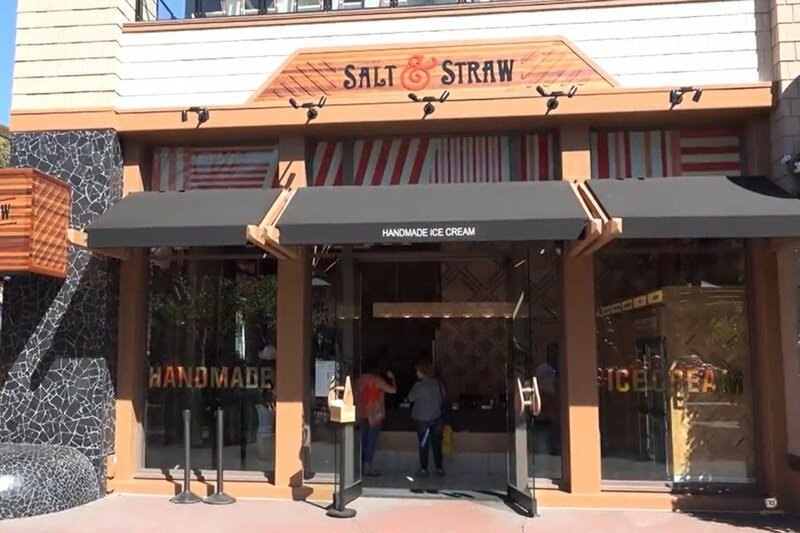 Throughout Downtown Disney you will also find an array of specialty kiosks for some additional quick dining and snack options. 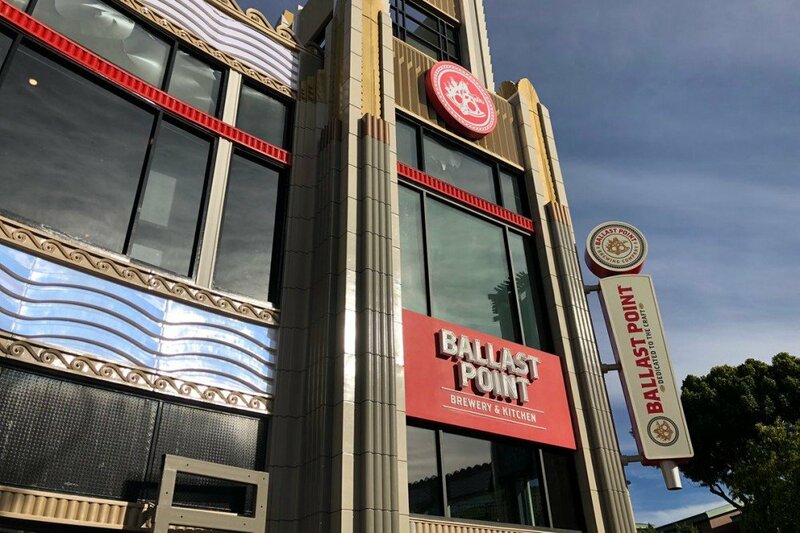 This popular San Diego-based brewery has expanded into Orange County! 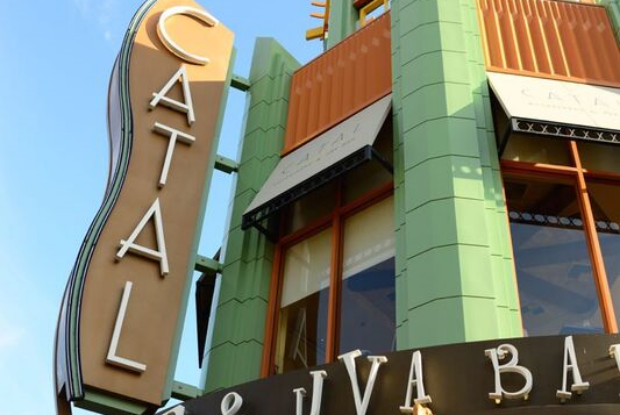 The Downtown Disney location not only features a brewery with on-site tasting room, but also a Southern California-inspired food menu featuring local ingredients. 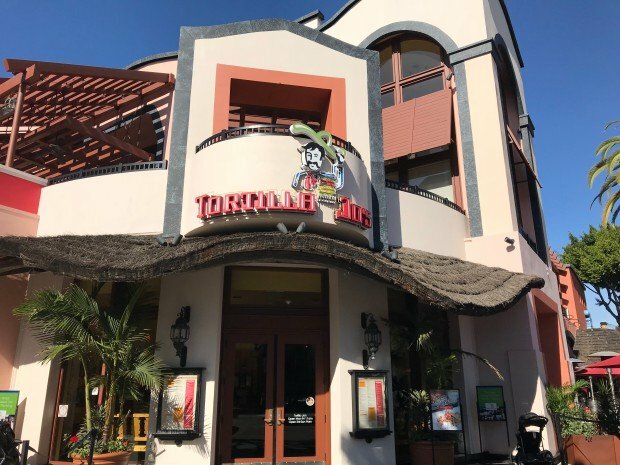 The entrance is near the former RideMakerz location, with the restaurant upstairs. Enjoy Mediterranean-inspired cuisine at this restaurant, with dishes such as traditional paellas or expertly prepared steaks. Appetizers include lamb meatballs, bacon wrapped dates or stuffed piquillo peppers. Reservations are available. 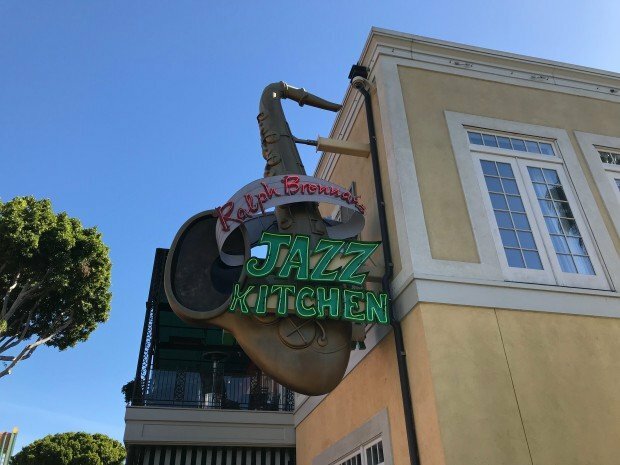 The kitchen is shared with the Uva lounge/bar located in the middle of Downtown Disney, where you can enjoy a drink & light snack or casual meal while you enjoy the atmosphere of Downtown Disney. This restaurant offers a vast array of soups, salads, wraps and desserts as well as their signature sandwiches using fresh artisan breads. 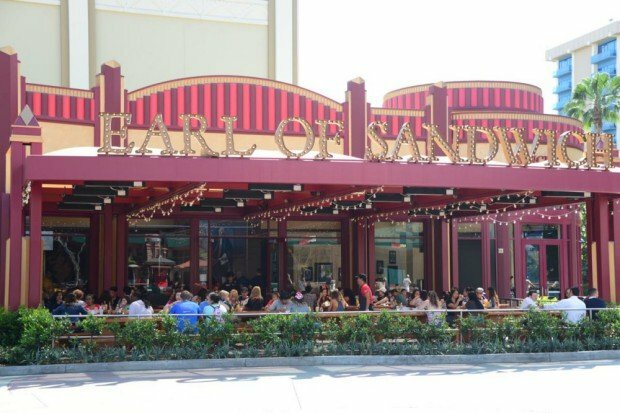 Earl of Sandwich features several different sandwiches, including The Original 1792, with roast beef, sharp cheddar cheese and creamy horseradish. This restaurant features grilled fare, including cedar plank salmon, grilled chops, and New York strip steak in a sports bar setting, with televisions tuned into the ESPN stations. There is even a room where the guest can sit in a comfortable lounge chair, and watch a wall full of TVs while enjoying the meal. Reservations are available. There is also a gift shop, and the upstairs has an arcade area, including a rock-climbing wall. 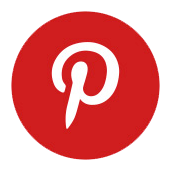 Refreshing fruit and vegetable Smoothies, Gourmet Pretzels and Breads. 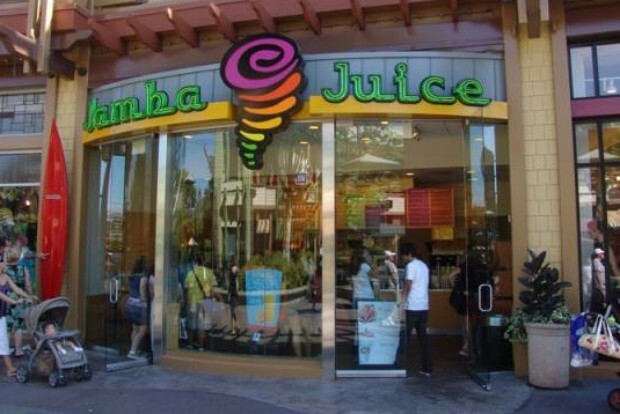 For a healthier option while on vacation, consider a smoothie instead ice cream. Fresh bread is baked here daily in an open kitchen. Come here for breakfast and get bagels, pastry, oatmeal, quiche, etc. and the right side is sit-down. Meals include sandwiches, salads and pastas. 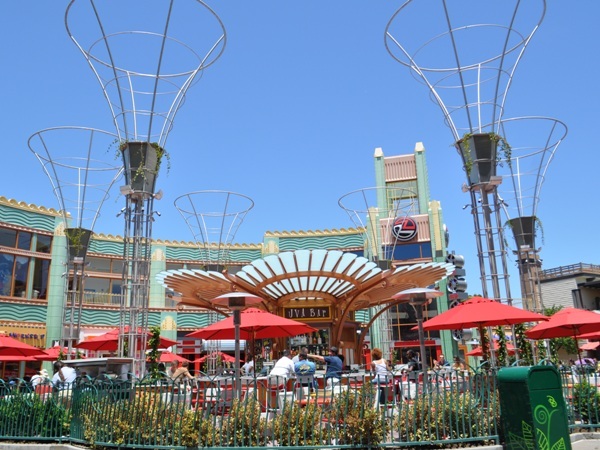 To the left is a cafeteria line, La Brea Bakery Express, where quick serve items and outdoor seating are featured. Enjoy Italian food, including pastas and wood-burning oven baked pizzas either indoors or out on the terrace. Reservations are recommended. ARTICLE: Review: Newly Renovated Napolini Pizzeria-Did It Change for the Better? Italian food to go! 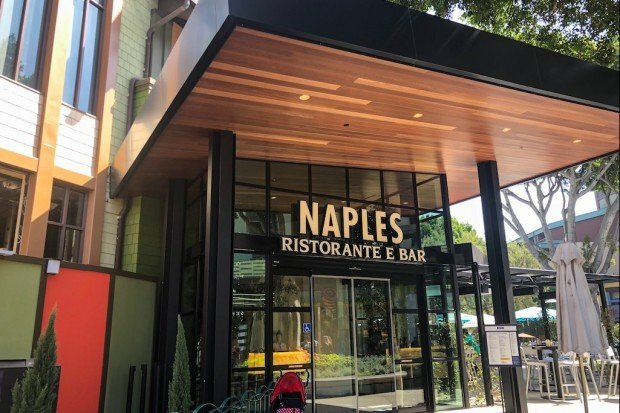 Napolini is located next to Naples Ristorante. 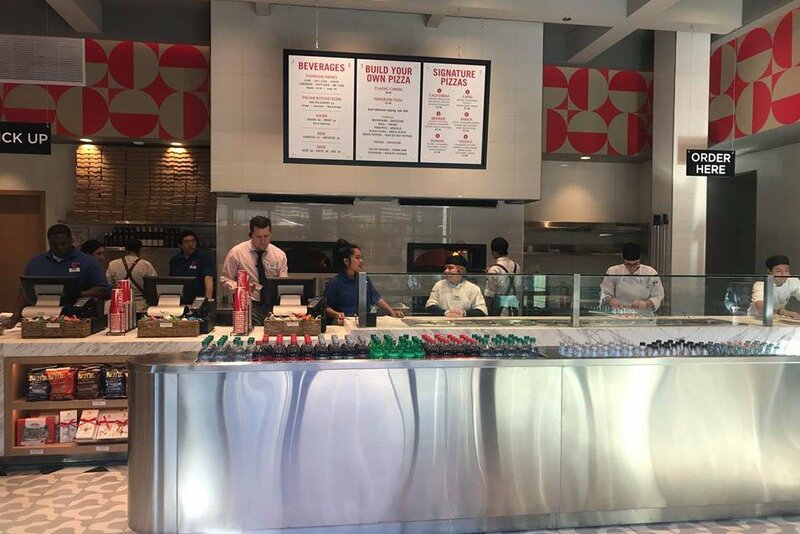 This quick service restaurant offers build-your-own pizzas that you can enjoy in their outdoor seating area. Quick service salads and sandwiches are available at Ralph Brennan's Jazz Kitchen Express. 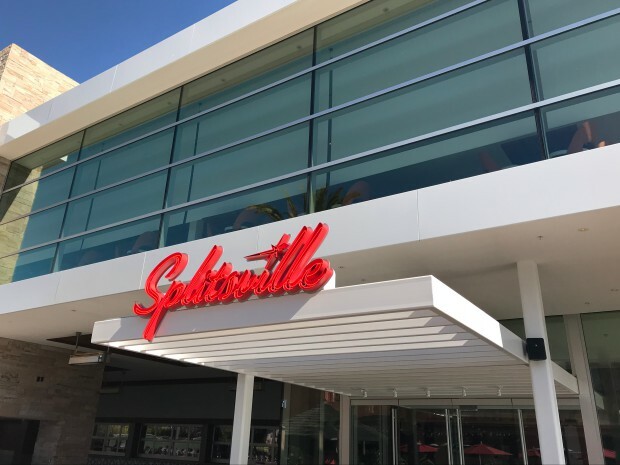 Splitsville features a full service restaurant serving sandwiches, burgers, pizza and sushi. The venue also has several bars, plus live music and 20 lanes of bowling. 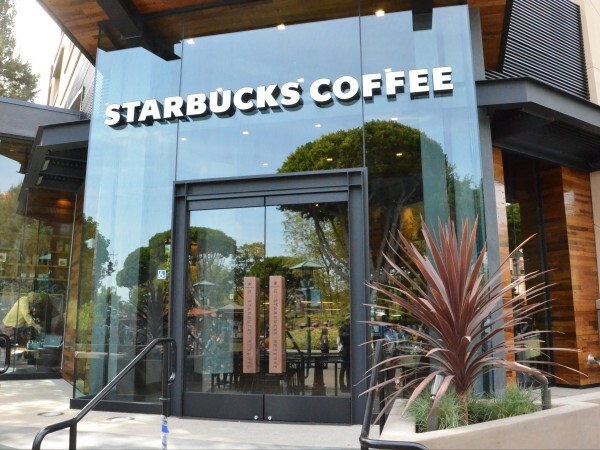 Coffee, tea and Starbucks pastries and sandwiches. There are two locations at either end of Downtown Disney. Indoor dining and open-air cantina dining in a Mexican inspired atmosphere. Enjoy nachos, burritos, enchiladas, margaritas, and table-side guacamole. Reservations are available. This is a nice option if you don't feel like sitting in a restaurant. 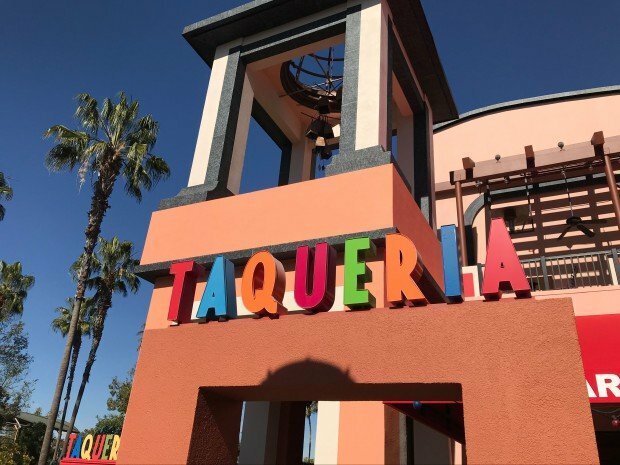 They serve tacos, burritos, nachos and desserts. There is a small outdoor seating area. This bar offers an extensive wine and draft beer selection, but don't let that fool you, it's not only a bar. They have some great appetizers and some tasty burgers & sandwiches for the whole family to enjoy . 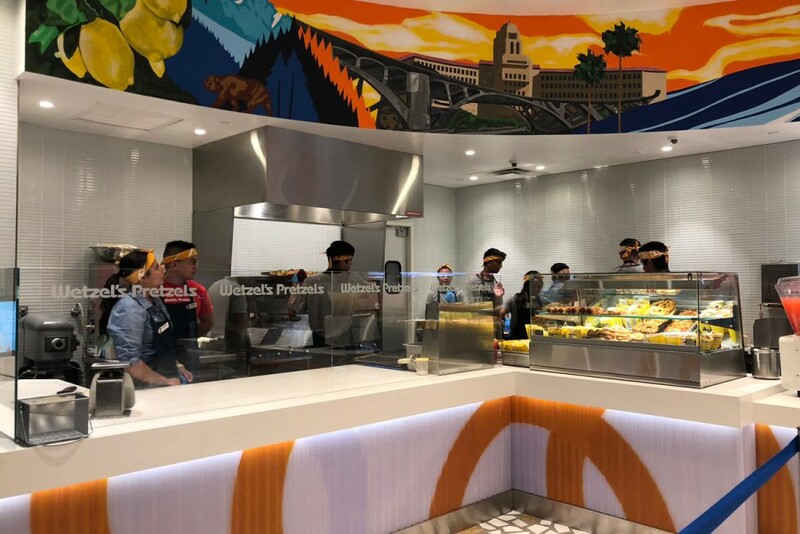 Wetzel's puts a whole new twist on pretzels, using only the finest quality ingredients to create such masterpieces as the Sinful Cinnamon, and Gratefully Garlic pretzels, just to name a few.